This is quite strange that this function is tagged as private in the DataGrid code. Then, it doesn’t appear in the documentation although this is really useful. This will move the column at the oldindex to the newindex. And you can also use an event. So ok… 3 lines of code. With its version 1.2, the component Flex Notification can be stacked. This has been suggested by 2 of my visitors and I think this was a very good idea. So, this is now possible using a new property to use in the Notification.show() method. The property stackable is set to true by default, so by default, the Notification will be stacked. 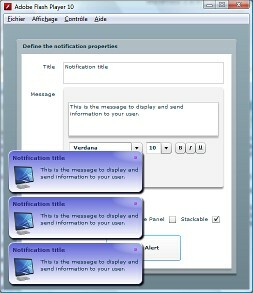 The NotificationStackManager is implemented as a Singleton. The Notification.show() method changed as the stackable parameter can be set between the iconClass and the notificationParent parameters. I hope this version will enjoy both current and futur users. You can check an updated demo at the original post.